Among the treasures on display at the new Battle of Bunker Hill Museum in Charlestown is the trowel used by Revolutionary War hero General Lafayette to lay the cornerstone for the Bunker Hill Monument at groundbreaking ceremonies in 1825. It’s a small thing. But to Alan Hoffman, the trowel, like anything associated with Gilbert du Motier de Lafayette, is very big. The Boston lawyer is so unabashedly obsessed with Lafayette that he has devoted several years of his free time to translating an out-of-print book that he says captures the spirit of the foreign aristocrat. “He was the best friend America ever had,” said Hoffman, who noted that Lafayette persuaded the French to send 5,000 troops to help the colonists in the Revolutionary War’s final battle at Yorktown in 1781. Today most Americans know Lafayette by name, in part because countless cities, towns, parks, and streets are named for him. They probably know he was French and that he fought in the Revolution, but not much more beyond that. Lafayette, born in 1757, was 17 when he heard about the colonists’ struggle. Defying his government and his father-in-law, he bought a ship and sailed to America in 1777, teaching himself English on the way. After landing in South Carolina, he served the Continental Army as a general and later, a lobbyist. After the war he returned to France and eventually fought in the French Revolution. But he never forgot his ties to America, and even had soil from Bunker Hill shipped to France for his grave. Hoffman is a longtime Revolutionary War buff, and his interest in Lafayette took a giant leap forward a few years ago during a visit to the Brattle Book Shop, where he found an out-of-print copy of “Lafayette in America, in 1824 and 1825.” The book, which chronicles Lafayette’s triumphant return to America, was written in French in 1829 by the general’s personal secretary, Auguste Levasseur. According to the book, Hoffman said, Lafayette received star treatment throughout his 13-month odyssey to this country, where he visited six presidents and was welcomed in an “adoring frenzy” by appreciative Americans who were still basking in the glory of their new republic. Hoffman had studied French and Latin in school, but that was long ago. So he was surprised when he opened the book and found he understood it. That evening, at the Londonderry, N.H., home he shares with his wife and children, he sat down at his dining room table with pen in hand and began a painstaking translation. During the process, Hoffman said, he found that Levasseur was a “gifted storyteller and a great writer” who described Lafayette’s adventures, including parades and parties in his honor, a cruise down the Mississippi, and a bona fide shipwreck, with thoughtful flair. The book also details Lafayette’s affectionate reunions with his fellow war heroes, including George Washington, who was godfather and namesake to Lafayette’s son. What started as a hobby turned into a two-year project that resulted in a stack of hand-written, loose-leaf pages nearly a foot high. When he finished his 600-page “labor of love” last year, Hoffman found a small New Hampshire publisher (called, coincidentally, “Lafayette Press”) that agreed to print 1,000 copies. Hoffman has spoken at a number of libraries and museums and was asked to deliver the governor’s proclamation last month in an annual commemoration of Lafayette’s death on Boston Common. The Bunker Hill Museum offers several reminders of Lafayette. 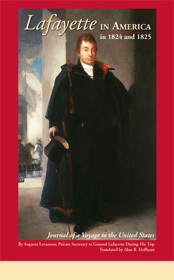 The book will be sold in the gift section, and an image of the general is among the museum’s artwork. And then there’s that historic trowel. The museum, housed in what was once a branch of the Boston Public Library, features a 360-degree cyclorama painting of the Battle of Bunker Hill, as well as a gigantic diorama of soldiers on the battlefield, which was formerly housed at the monument itself. The entire project, which cost $3.7 million, included the museum as well as the improvements to the monument across the street and its surrounding grounds. During a private visit to the museum last week, Hoffman smiled as he took in all the museum had to offer. “This is just beautiful,” he said. He appeared content to linger all day, until the city officials who had invited him into the museum began gently nudging him toward the door. Descending the museum’s staircase, Hoffman gave one more indication of his devotion to the history of the site. The museum and monument are open every day except Christmas, Thanksgiving, and New Year’s Day, from 9 a.m. to 5 p.m. Admission is free. Go to nps.gov/bost for more information.